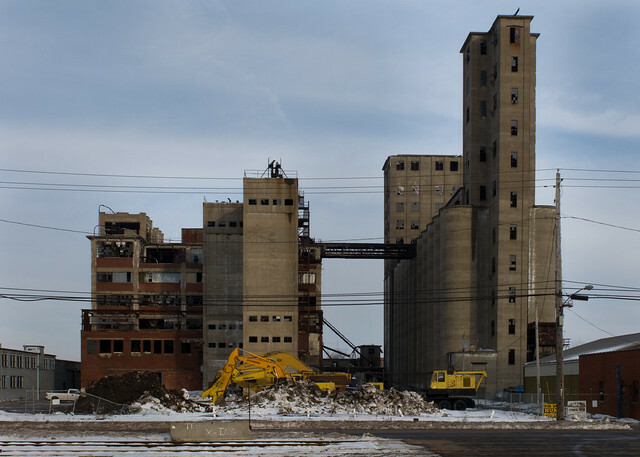 The City's Preservation Board voted unanimously on Thursday afternoon to table Ontario Specialty Contracting's request to demolish portions of the GLF/Wheeler grain elevator complex on Ganson Street. The meeting room was packed with people who were on both sides of this emerging preservation issue involving one of the City's most important industrial heritage sites. After an hour long discussion with Ron Chapin - from Ontario Specialty Contracting - the Preservation Board decided to table OSC's request to demolish parts "B" and "C" because the application was determined to be incomplete. OSC presented a number of photographs - here, here and here - depicting a deteriorating structure. The Preservation Board is asking OSC to provide an engineering study to determine the real condition of these structures. In addition Henry Baxter, internationally recognized expert on concrete elevator design and structural condition has generously made his services available to assist the Preservation Board in making a decision about the future of GLF. Henry Baxter's grandfather - A.E. Baxter - designed and built portions of GLF. Ontario Specialty Contracting - one of the City's premier demolition contractors - purchased portions of the GLF complex last October. GLF is immediately adjacent to OSC's office and heavy equipment storage site on Ganson Street. 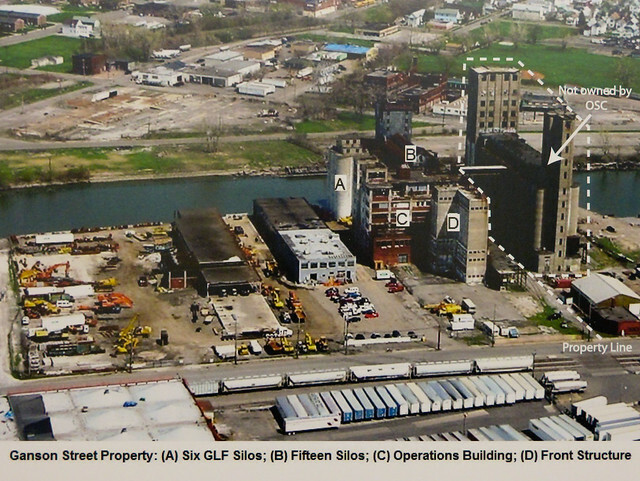 The photo below shows the portions of the GLF complex that OSC owns and the location - two single story buildings next door - of their headquarters. Here's a bing map if you're not familiar with the area. 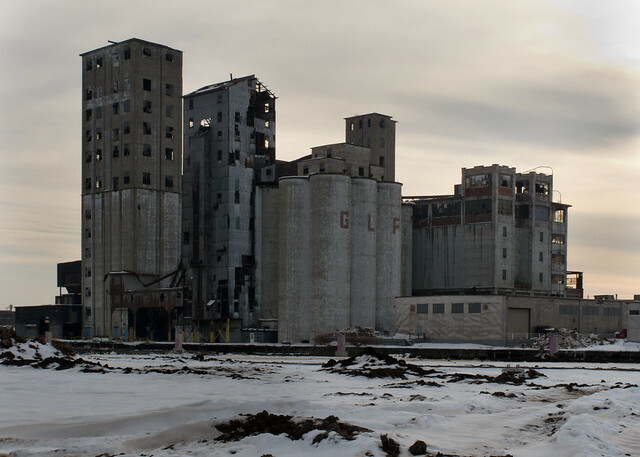 The remaining portion of the GLF elevator was last reported two years ago to be on the market for $3.5M. Here's that story. 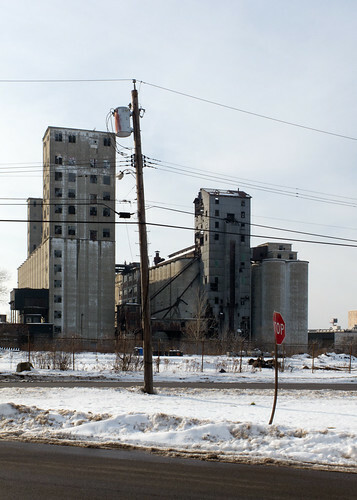 The significance of Buffalo's remaining industrial heritage sites can not be emphasized enough. Even in their neglected state they are stark and subtle reminders of our glorious past. They are frequently studied and photographed. 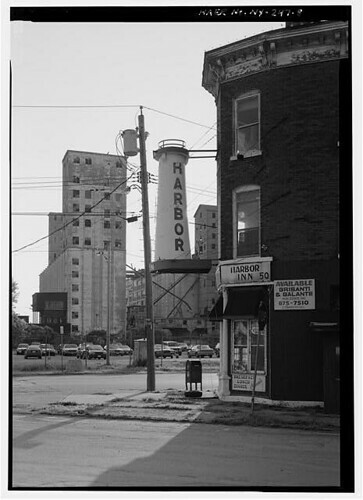 German photographer Gerritt Engel was here in 90's and our collection of elevators was the subject of his first book and exhibit - Buffalo Grain Elevators. Here's a recent video where he's interviewed about his work. 1994 photo (HAER credit) of GLF from Chicago Street and a recent photo from the same location. More recently a number of community activists and organizations have taken a strong position on the deep cultural value of Buffalo's waterfront and the importance of these long neglected industrial heritage sites. Make sure to watch the following video about this powerful and emerging voice describing how the City of Buffalo is being reinvented. Prior to Thursday's meeting I spoke with two community leaders who support the Ontario Speciality Contracting position and demolition. Here's the short podcast (5:17) with Laura Kelly, Executive Director of the Old First Ward Community Association. I also spoke with Peg Overdorf, who is the Executive Director of the Valley Community Center. Here's that short podcast (3:24). Riverfest Park - aka 'Peg's Park' - is located opposite GLF on the other side of the Buffalo River. 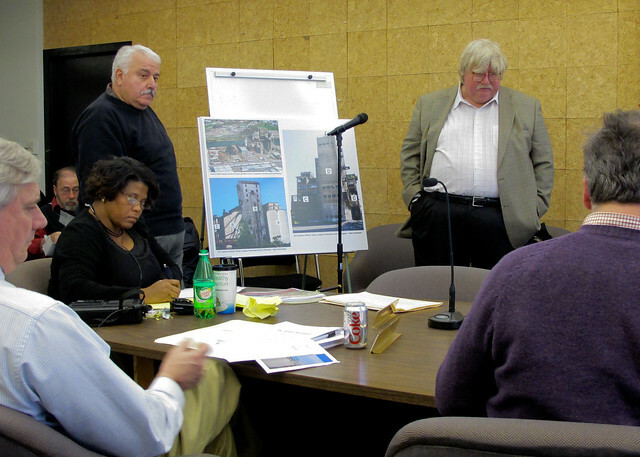 The full recording of Thursday's Preservation Board hearing about the planned demolition of portions of the GLF Elevator is available - here (68:30). I met-up with Joshua Reis and Emily Gaines the other day. 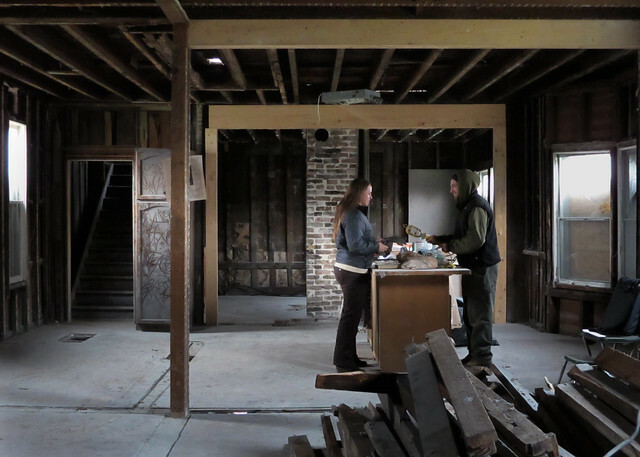 We talked about their work and plans for one of the City's newest homesteads - 226 East Utica (google map). Joshua recently closed on the formerly City-owned house and is plowing forward with a contagious mix of grit and grace with his partner, Emily. Josh is drawing inspiration for his work from his studies at the Finger Lakes Permaculture Institute, which he attended in 2009. Since taking courses at the institute, Joshua has continued his interest in permaculture, reading books such as Gaia's Garden and Edible Forest Gardens. He also gained insight from an on-line resource - Permaculture Activist. Emily teaches music at the Bennett Park Montessori Center in Buffalo, NY. During the past year she has participated in dance and drumming classes around the corner from her new homestead at the African-American Cultural Center on Masten Avenue. For her, this has been an exciting continuation of almost 8 years of study of African music. Emily is new to the ideas of permaculture and is living proof that the ideas of urban farming are accessible to anyone who believes in his/her community. A fellow community member and friend, Matt Zinski is the architect for this project. Matt was featured in a recent Artvoice article about his Capoiera classes on the West Side. Joshua is his student and the Capoeira community has been instrumental in the progress made at 226 East Utica so far. 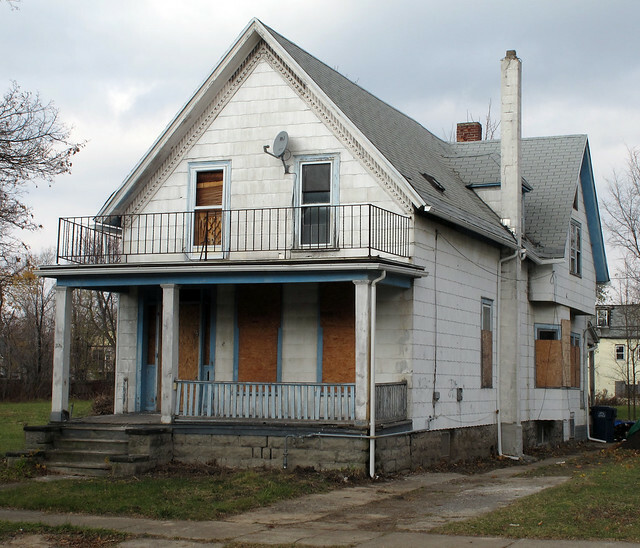 fixBuffalo readers may remember this post about 226 East Utica (March 2008). 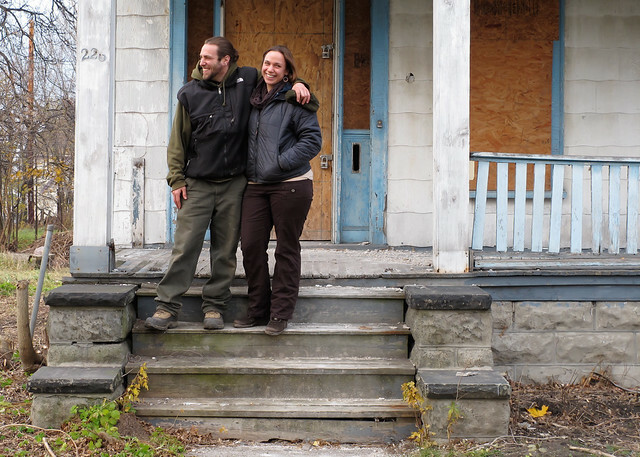 While a number of people have expressed an interest in calling 226 home, Joshua and Emily are doing it. Stop by and visit and/or keep track of their progress in this Facebook album - Solrise Farm. Here's a podcast with Joshua and Emily (after the jump, running time nine minutes).